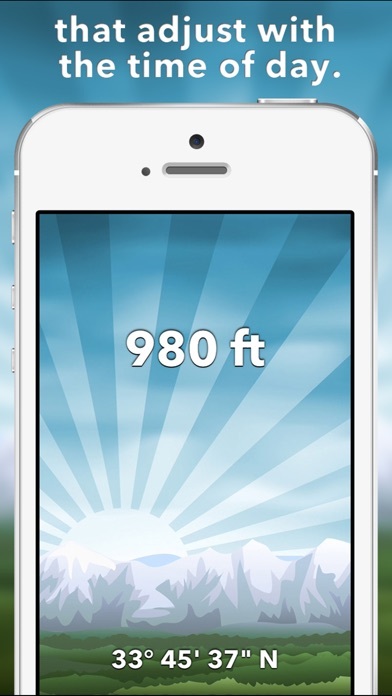 View your altitude or elevation on stunning landscapes that adjust with the time of day. The barometer lets you track your altitude changes based on the change of pressure. Just set your reference pressure and altitude in order to use the Altimeter for seeing the difference in elevation of two points. Great for hiking and other outdoor activities. 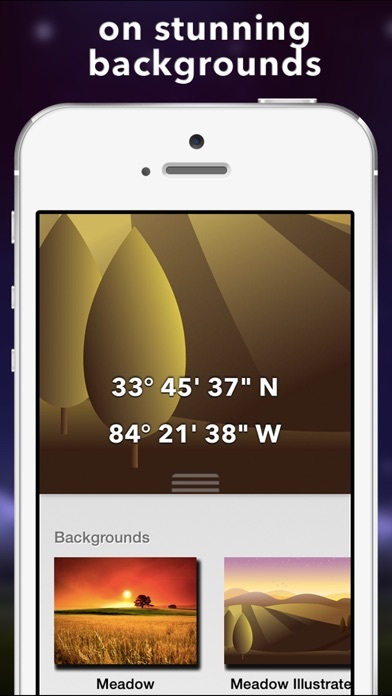 The Compass shows your real-time orientation in this elevation app. 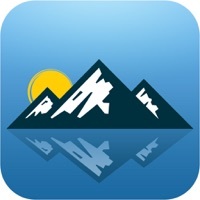 5-Star Reviews: "I love this app, wherever I go snowmobiling or hiking I always use it." "This app really works well. I enjoy checking the altitude wherever I am. Nice!" 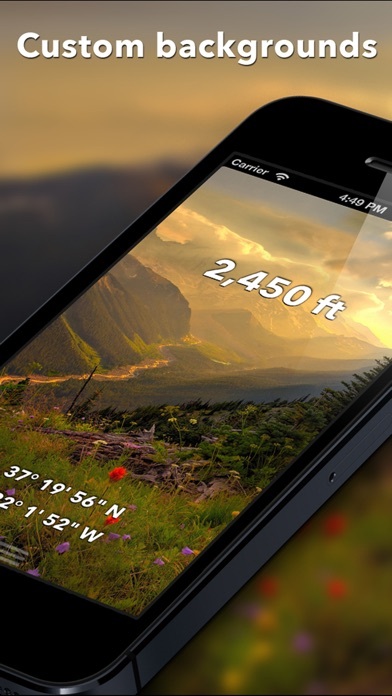 A simple and uncluttered interface to read: • Altitude or Elevation • Latitude • Longitude Features • Highest GPS accuracy for your device • Ground elevation from topographical map values • View in feet or meters • Built-in flashlight Sharing • Share screenshots with beautiful backgrounds • Share on Twitter, Facebook, Instagram, Email, or text message Use the Custom Background upgrade to take a photo from the top of a mountain and take a screenshot with your altitude overlaid to show your family & friends. Backgrounds (In-App purchases): • Meadow landscape (Illustrated) • Cityscape (Illustrated) • Mountains (Illustrated) • Abstract • Choose Your Own Note: Many customers with high altitude illnesses or sensitivities, such as chronic lung disease, asthma, COPD, & emphysema find this app useful for avoiding high altitudes. It is also used by hikers and climbers who want to avoid high-altitude cerebral edema (HACE) and high-altitude pulmonary edema (HAPE). 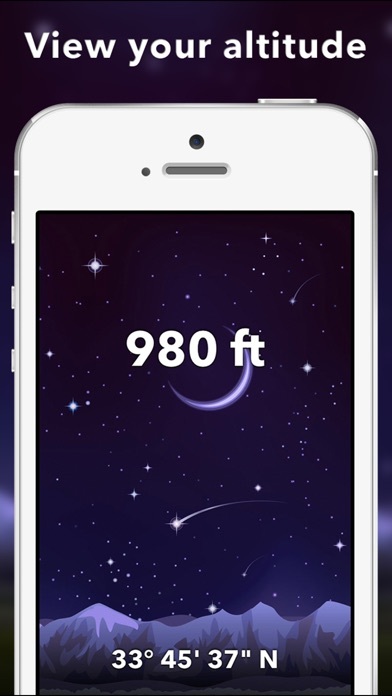 However, the altitude shown is potentially subject to large inaccuracies and this app should NOT be used as a primary device for determining altitude for medical reasons. A great app that does what it claims and does it very well. I use it all the time driving through the mountains and find it very useful. I would like to recommend this app to all those who need to learn the different altitudes where are working with natural elements as level as of Forrest, water well drilling, rocks’ formation, it will help you out to relate all those elements in specific geographical areas. When I was a boy traveling with my Dad in his cars , he loved having an altimeter to watch while he was driving. I love to do the same thing. Thanks. This app does not work on Apple Watch 4. Don’t spend the money on eliminating ads until you know it works on watch. My mistake. They make you pay for backgrounds🤔😄 why would any one pay for that? It was great before I moved to the mountains. With the altimeter I can easily survey expected snow levels to prepare for snow and other travel. Very tricky. The ‘Remove Add’ button turns into an in app purchase before you can take your thumb off the home button. And there is no way to reverse it. Apple App Store, you should investigate this! Handy, accurate & easy to use. SO I institutionalization 2 years ago! I used it on iPhone 7 & it was great & accurate. But, with my new IPhone XS it shows an altitude about half of known altitudes. Do you know what the issue could be? I love this app. I run at 7000 feet and work hard at keeping my lungs in shape. It’s not perfect but gives a good baseline. I can’t get it on my Apple Watch. I downloaded in the watch app but it doesn’t show as an available app to add to my apps on watch. It gives you the altitude above sea level anywhere in the country with even a slight bit of cell signal! 100%! Download it! The GPS function seems to be right on - within 50’ compared to Google Earth. The altimeter is close - probably within 10-20 feet compared to Google Earth. Super for “How high up are we?” but not close enough if deciding how high to build your house above the river. I require oxygen at higher altitudes. I am amazed at how well this app works even in high mountains. I know when to use my supplemental oxygen because of this app. Garbage not accurate at all!!! Simply user friendly and works well. Wonderful tool for using on properties!! Lately, more often than not, this app is not displaying my altitude, and on several occasions it will display altitudes that differ by a couple hundred feet altitude readings from different locations on the same level in our home. Wouldn’t want to go skydiving with this app as my only reference. On series 4, of I'm away from my iPhone on a walk, just says "loading..."
I really like being able to know the altitude and not guess. I have found huge inconsistencies in the accuracy of the altitudes displayed from the same position and at different times. As much as 75 feet +. If this is based on barometric conditions rather than geodesic position it will very a lot ! Easy to read, more accurate than the compass on iPhone. Right now as I write this, just landed on Seattle on Alaska Airlines and with their wifi capability in flight was able to see flight altitude MSL. Love that it shows long-lat, too! Best part-FREE! Your compass is off by 180 degrees!